STANDARD SACK COATS: Sizes 38-48 Regular Length; Enlisted; Unlined; Untrimmed; 7-Button Front CS Sack Coat in Medium Gray wool, or 4-Button Front US Sack Coat in Navy Blue Wool. All Budget-line Sack Coats. For the reenactor seeking greater authenticity. J. T. Martin was the largest contractor for the Federal government with plants in New York, Philadelphia, Cincinnati and St. Louis. 85% of the J.T. Martin coat was machine stitched within the factory and the rest of the coat was hand stitched. This J.T. 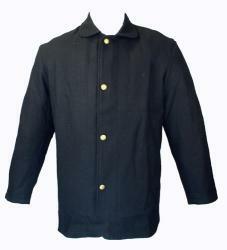 Martin 4 button sack coat is made similar to those made during the Civil War. This coat features a 9-11 oz. Federal (navy) blue wool. The body of the sack coat is lined with 9-11 oz. tan wool and the sleeves are lined with muslin. It has a roll collar, an inside pocket, and a 4 button front of medium 3/4" Federal Eagle buttons. This coat is an authentic reproduction but without the hand stitching where the lining meets the collar, where the bottom of the sleeve lining meets the wool, and the buttonholes. Hand stitching over the machine stitching of these areas is available as an option. Otherwise, the customer may hand stitch these areas. Call us for detailed instructions. For fatigue duty, US soldiers were issued a blouse, commonly called a “sack coat”. This basic US 4 button sack coat is made of 20 oz. Federal (navy) blue wool. 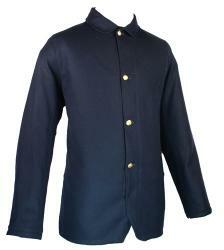 It has a roll collar, is unlined, has an inside pocket, and has a 4 button front of medium 3/4" Federal Eagle buttons. Muslin lining is an available option.